Recently I’ve been seeing some very complicated DIYs for making a summer skirt. It really doesn’t have to be that bad !! 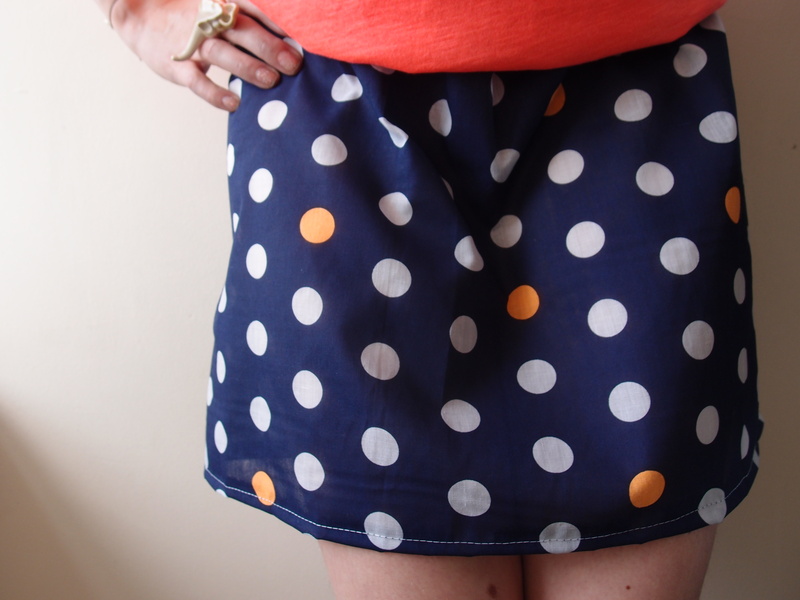 Making a skirt is one of the easiest things to pull off in DIY fashion and you can most definitely make a very cute one for just a few £s / $s. 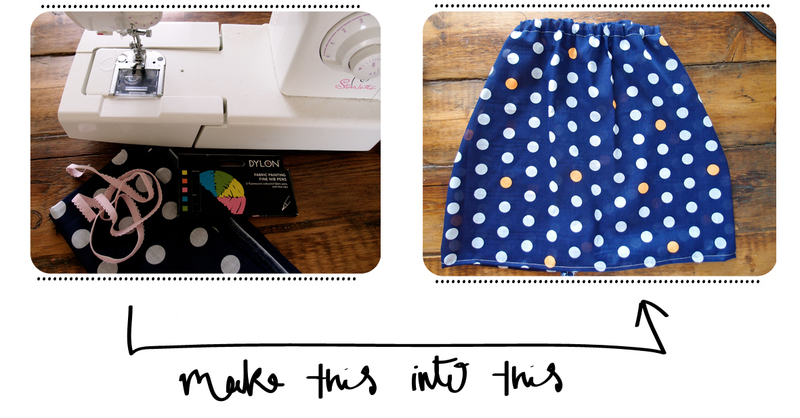 In almost any haberdashery you will find the classic polka dot cotton I used to make my skirt. To update the pin-up look with a little neon, I filled in random dots with a Dylon neon fabric pen. The rest is just three seams, a waistband and you’re all set ! 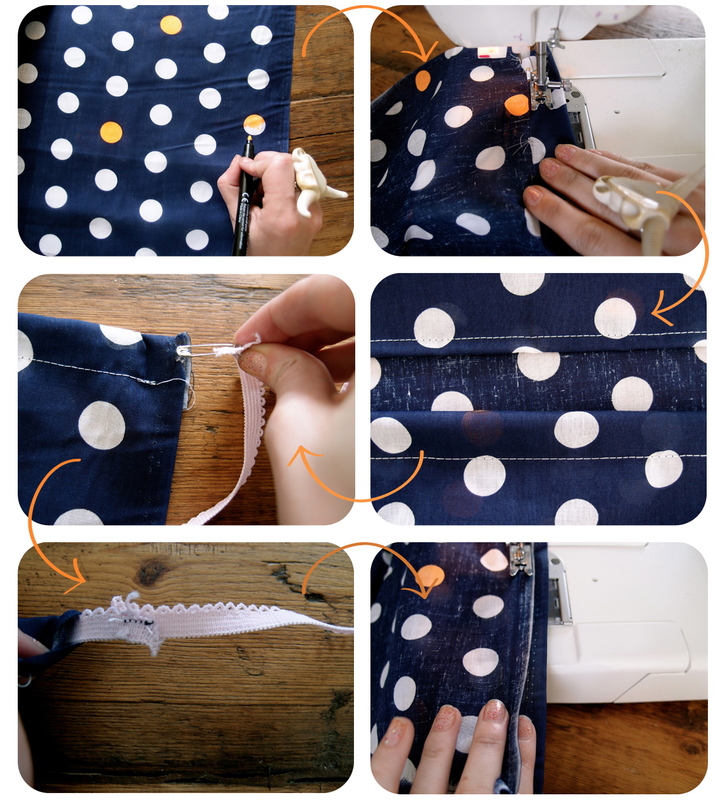 This tutorial could also be used by people wanting to make a summery maxi skirt. 8 : Cut off remaining thread, balance the ruffles around the skirt and wear with pride ! / Coupez les fils qui dépassent, équilibrez les plis autour de la taille et portez avec fierté ! If you have any sewing tips or come across any problems you managed to solve on your own, why not share your advice on my Facebook page ? 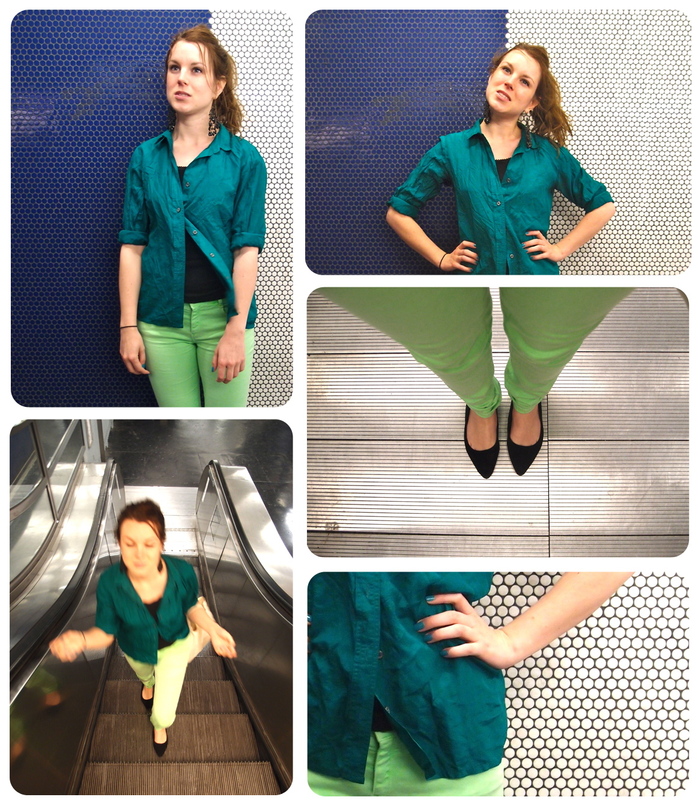 Last week I posted a trendspotting post about geometric prints. 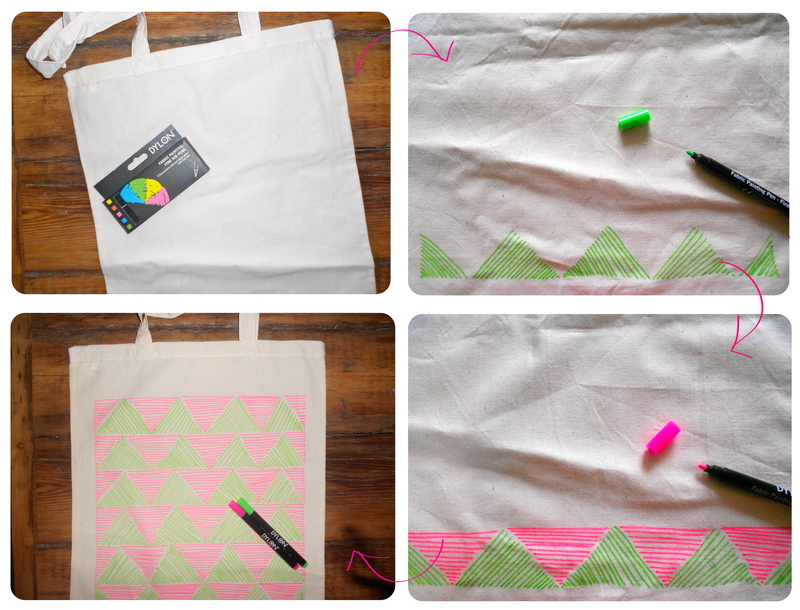 Just to show you how easy a trend this is to DIY, here as a few photos of how I DIYed a simple tote with a couple of Dylon neon fabric pens. These pens are great, all you have to do is draw on your design and iron to fix the paint – simples ! 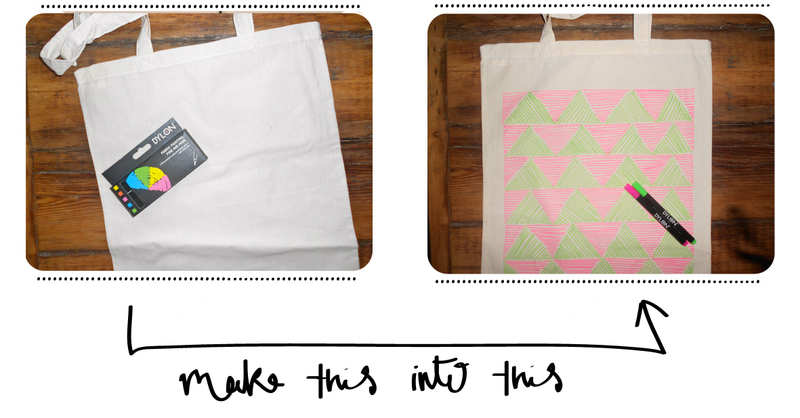 I went for roughly drawn triangles because I like the effect of a hand drawn picture on a tote bag, nice ‘n’ childish. La semaine dernière je vous parlais de la tendance des imprimés géométriques. Pour vous montrer à quel point cette mode est “customisable”, voici quelques photos d’un projet réalisé avec un sac cabas et quelques stylos de peinture à tissu aux couleurs fluorescentes de chez Dylon. Ces stylos sont vraiment pratiques, il suffit de faire son dessin puis de repasser le tissu pour fixer la peinture – fastoche ! J’ai choisi de faire des triangles à main levée parce que j’aime beaucoup le mélange sac cabas / dessin enfantin.